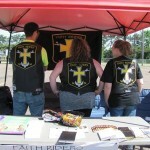 The Chippewa Valley chapter of the Faith Riders was formed in January of 2015. We are the second existing chapter, the original chapter being the Winona, Mn. 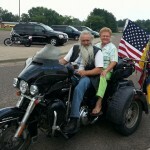 Faith Riders headed up by our National Coordinator, Chris Parker. Our current chapter elder is “Tunes” Mike Gutouski from Eau Claire. Four of the eight current Chippewa Valley members are current Pastors of local Churches. As of September 2016 I am currently a member of our newest chapter in Ashland, the “Chequamegon” chapter. 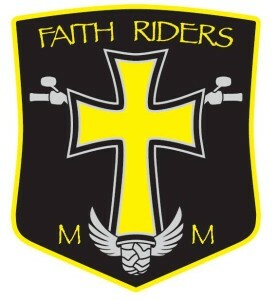 We are now the 3rd chapter of the Faith Riders MM. Our current chapter elder is “Duce” Nathaniel Doucette. 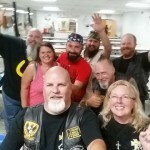 We are a non-profit organization dedicated to reaching people for Christ in the highways and byways through motorcycling. 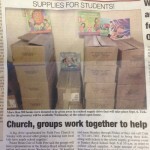 We ARE NOT a club, but a ministry. 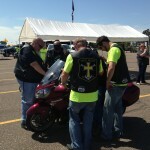 Weather as a group or individually, we are involved in many things while representing the Faith Riders Ministry. 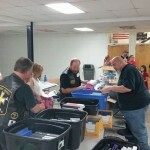 We do prison and jail ministry, blessing of the bikes, pet blessings, community service projects, witness at various rallies and runs, witness to the local 1%er clubs in the State, support our military veterans, ride in parades while handing out Bibles and tracts, etc. Below you will find a schedule of some of our events we will be part of in the coming year, but more often than not we do much more ministry work than what is on the calendar. 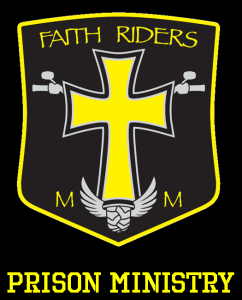 Click here for a short video on some of the things the Faith Riders are involved in. 1/25/16 – Pet Blessing at Wag-N-Tails. Opening prayer begins at 6:00pm. 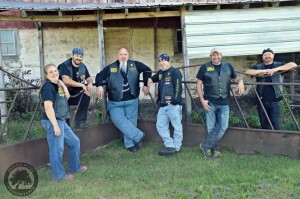 2/20/16 – Faith Riders of Chippewa Valley meeting to set yearly calendar. Spider’s house 11:00am. 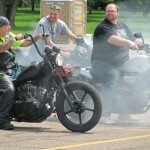 April 2-3 – Donnie Smith Bike and Car Show – St. Paul River Centre, St. Paul, MN. April 30 – Fundraiser ride with 18 Wheels MA. – Raising money to help pay for a funeral of a 16 year old girl who lost her battle with cancer. 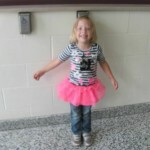 Torrie she died last April of cancer and this family needs help paying for the remainder of the funeral costs. 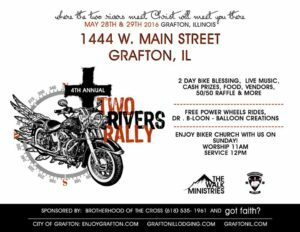 Donations of 20 dollars for single riders 25 for couples.cars are welcome as well donation of 15 dollars. 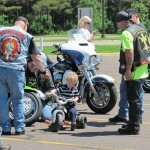 Registration starts at 9 am kickstands up at 11 am .218 developmental drive Stanley wi.I encourage all to attend.we will end up back at our Wisconsin house for food DJ and the company of each other to help this family.This family really needs our help please text Digger at 715 721 0203 with any questions or details you might need. Thank you in advance to all who come to help this family. 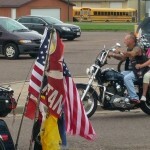 *May 14 – Honor the Fallen Run – Deertail Lodge, N3846 Grant Drive, Ladysmith, WI. 8-11:00- breakfast and registration, 11:00 100 mile run. 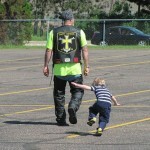 *June 12 – Unity Service, La Canne Park, Goodview, MN. Time and details pending. June 15 – Franklin Graham Prayer rally in Madison, WI., 12:00pm. June 20 – Ride Your motorcycle to work day – Everywhere! 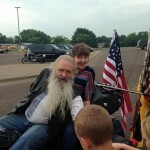 July 15 – Wisconsin CMA State Rally, Wild Rose, WI., all weekend. Float-Rite campground in Somerset, Registration 9-11, Ride at 11:30. 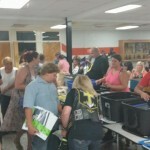 August 6 – Winona Chapter Sturgis outreach – Location TBD. August 6 – Spokesman’s MC Annual Pig Roast, Hideway tavern, all weekend. 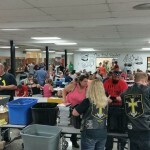 August 14 – Crossroads Church of Pittsville bike blessing – 10:00am. 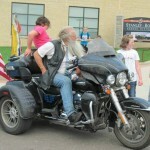 *August 27 – OCC Faith Riders Winona event. 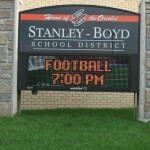 Time and location TBD. 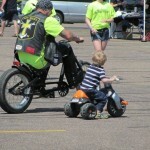 September 15-17 – Tomahawk Fall Ride – Tomahawk, WI. All weekend. 8-11 breakfast and registration, 11:30 run. October 7-9 – CMA Apple Run, Poplar, WI. All weekend. October 7-9 – Gathering at Lee Ford’s Triple F Ranch all weekend. 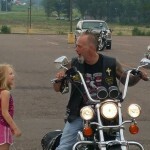 Testimony at the “Rescue Shop” Biker Church in Green Bay, WI. 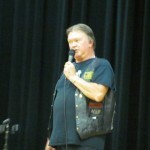 Sermon called “Redemption Song” I did at the Biker Sunday service at Crossroads Church in Pittsville, WI. 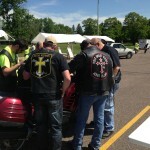 A video set to pictures of a recap of the Chippewa Valley Faith Riders and some of the many opportunities we had this year of bringing the Gospel message to others, showing the love of Christ, and serving our communities. 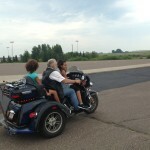 A video collaboration of a “Pay It Forward” event both of the Faith Riders Chapters were involved with at Midtown Foods in Winona, MN. where we randomly payed for people’s groceries, gave away hams, carried groceries, and prayed with customers and gave free hugs! 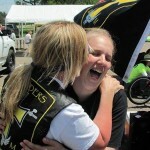 One of our Faith Rider sisters went down on her bike in 2014. As a result of the accident she wanted to do a PBA, or a God Announcement: If something was to happen to us today would you be ready?! Here’s the video. We strive to be involved in motorcycling events across the country and in taking the Gospel of Jesus Christ in to the streets. By remaining visible, we demonstrate God’s presence and seek to share His word. 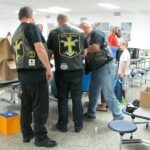 Faith Riders operates under the headship of a national Coordinator working in conjunction with State Coordinators, and local officers as needed. Together, this leadership team oversees Faith Riders from a national and State level to mentor area and local members across the country. The National and State Coordinators are available to provide guidance to local ministry chapters in order to maintain the vision of the ministry, but not to serve as limitations of restrictions to Godly paths local ministry chapters are led to pursue. The only exception, the approval of any proposed changes to the By-Laws and Handbooks which must be reviewed and approved by the Coordinators. Go out onto the highways and byways and lead people to Him. 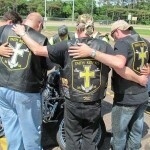 Evangelistic outreach, ministry, and discipleship to the motorcycling community and all of those we may meet on the road. 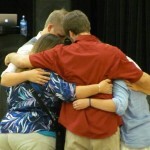 Being there when people need us: having a servant’s heart to fellow members and to the world. Remaining visible and approachable to those seeking Him. Maintaining strong community and fellowship between members and by increasing our ministry through reaching new members who meet the Statement of Beliefs defined for membership. 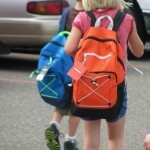 Go out…serve as ambassadors for Christ…and make disciples of all nations! The Trinity – The nature of the one true God we serve. Within the nature of the one true God exist three eternal distinct persons called God the Father, God the Son, and God the Holy Spirit who are co-equal, co-eternal, and co-existing in being. The Deity of Jesus Christ – Jesus Christ is God the Son. Jesus Christ is Lord. The sinless (righteous) life of Christ. The miracles performed by Christ. Christ’s shedding of His blood and death on the cross to once and for all atone for our sins. Christ’s bodily resurrection three days after His death on the cross. Christ’s ascension to the right hand of the Father. Christ’s future physical return to earth in power and glory to judge the world. The blessed hope – the rapture of the Church at Christ’s coming. God is the Creator who Created everything – God created us in His image. Sin – Sin came into the world through Adam and separated us eternally from God. Our attempts to bridge the separation between us and God is futile unless we accept Jesus Christ as Savior. Salvation by God’s grace (unmerited favor or gift) to us. 1.) By faith in the righteousness of Jesus Christ, the shedding of His precious blood on the cross and His bodily resurrection from death as the only means of being forgiven and cleansed of sin. 2.) By faith and confession, we recognize that we are sinners, repent (turn away from our sins), acknowledge our need for Jesus Christ, and receive Him as Savior and Lord. 3.) Become born-again Christians (believers) by receiving Christ as Savior and Lord. 4.) Assured (cannot be lost) to every true believer by God’s grace and keeping power. Regeneration by the Holy Spirit is absolutely necessary for personal salvation. Sanctifying power of the indwelling Holy Spirit enables the Christian to live a Holy life. Biblical baptism by immersion in water as an act of obedience. Resurrection of both the saved and the lost: The saved go to everlasting life and the lost to everlasting damnation. Belief in a literal Heaven where the saved (those declared righteous) will enjoy everlasting life in the presence of the Lord. Belief in a literal Hell, a place of everlasting punishment and suffering, reserved for the wicked.